One of the major recurring themes of my book and here on The Benshi is the simple “Arouse and Fulfill,” couplet I learned from USC Communications professor Tom Hollihan (who in my interview with him attributed it to a slew of communications theorists over the ages). It’s a powerful and fundamental principle for effective communication — PARTICULARLY with tough crowds — in order to achieve the elusive goal of PERSUASION. But she was smarter than that, and more skilled as a communicator. Instead, she knew instinctively how to begin by “arousing” her audience and, more importantly, by opening a channel of communication through common ground. She began by entering into this taboo, forbidden territory of racial discrimination by offering up her confession of how she herself discriminated against the white farming couple. Instead of cautiously starting her presentation with the politically correct message — cutting to the chase, as literal minded people would prefer — she took this politically incorrect side trip which clearly opened up everyone’s channels of communication — you can hear on the tape the audience members openly agreeing with her. Then, and only then — once she had established her COMMON GROUND — did she take a turn in her story to offer up her testimonial of seeing the error of her ways, which eventually led to her message of it being about poverty not race. The result was that instead of speaking to a glazed over, unmoved audience, she managed to engage them in her own story of revelation. And that is the goal of PERSUASIVE communication. But the tough thing is, YOU HAVE TO TAKE RISKS. She took the risk, benefitted in the short term (before the Breitbart flap), suffered in the medium term (the flap), but now that she’s had her job offered back to her and become the focus of national attention, you have to conclude she’s scored big time in the end. Moral of the Story: Don’t dream about scoring big with communication if you’re not willing to take risks. A lot of environmentalists are so thin-skinned (and they really are — they’re famous for it) that all they have to hear is me saying one critical word about their hero Al Gore and they shut down. In light of this, I did a very delicate and detailed job in my book of not saying a single critical comment about him or his movie, which then threw some people when I later began offering up my critique of the movie. But I stick with EVERY word I’ve said and written about him and the movie, and here is the bottom line: Overall, Al Gore is the greatest environmental hero of modern times. TAKING RISKS: Something that hasn't happened for the mass communication of global warming since 2006. Why? Of course, he also took part in a lousy movie (thus my critique), but here’s why he is a true hero — because he and his movie are THE ONLY HIGH RISK PROJECT launched for the mass communication of global warming that has registered on the national mass communication radar screen. They opened the movie in only 2 two theaters in NY and LA. That’s how nervous they were about their big gamble. It eventually made $50 million worldwide, rocketed global warming to the top of the news, and changed the course of the national discourse. It wasn’t a perfect movie (again, thus my critique), but it at least had an impact. It scored brilliantly on the awareness side, though failed on the persuasion element. Well, I’m sorry, but, no, I don’t, and we don’t. That sort of thinking is the very source of the problem. It’s called a lack of follow through. Major projects need to be looked back on for detailed critical analysis. THAT IS HOW WE LEARN. That’s the entire point of my video a couple months ago about the 1969 Santa Barbara oil spill. All the knowledge to prevent the recent Gulf spill was right there in that 1969 event, but so few people are willing to expand their perspectives beyond the here and now that a lot of potential learning never happens. This is part of the reason we study HISTORY — to learn from the past. 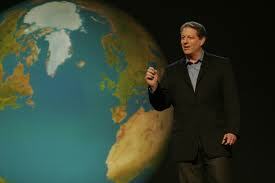 It is crucial that we NOT let the Al Gore movie go. 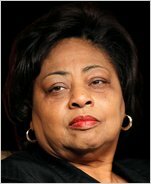 There are things to be learned about the down side of it (it was not a persuasive piece of media — he failed to do the brave thing that Shirley Sherrod did — he failed to open the channels of communication for the unconverted part of his audience). But equally important, we have to look at what was brilliant and successful about the project — that they TOOK A RISK. And even more importantly, that movie isn’t one of 20 landmarks in the history of the mass communication of global warming in the U.S. To the contrary, it is about the ONLY landmark and is 95% of all meaningful accomplishments to date when it comes to reaching the public. If you stop your average person on the street and ask them what they know about global warming, that movie (whether they saw it or just heard the buzz) is the ONLY thing about all of them will have in common. It isn’t just one part of the story, it IS the story. And yet … in the 4 years since it there have been no further large scale “experiments” attempted. And by the way — where did the financing come for the Al Gore movie? Did it come from any of the major science agencies (as it should have) or from the big environmental groups (as it should have) or from any university coalition (as it should have)? No. It came from Hollywood. Now you know why I left academia and moved to Hollywood. People actually still take risks here.